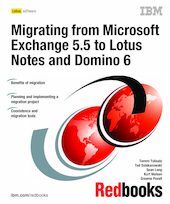 This IBM IBM Redbooks publication describes why and how to migrate from Microsoft Exchange 5.5 to IBM Lotus Notes and Domino 6. It begins with a discussion of the reasons an organization using Exchange 5.5 would want to move to Domino 6, and describes the benefits that can be gained. It lays out the different options that the organization has for a future messaging infrastructure and discusses the pros and cons of each alternative. It is particularly suited to business and IT managers. The next part is about planning and managing a migration project. It covers how to assess the current messaging environment, design the migration project and future infrastructure, and successfully implement the migration plan. This part is primarily of interest to project managers and IT architects. This material is useful for anyone who has to evaluate the tools, install them, and conduct a messaging migration project.